STARDOLL FREE | Underneath Stardoll Blog: A change in plan. Hello everyone. Due to the great amount of people leaving the competition there has been a change in plan. Instead of going on with our normal rotation of making tasks, and continuing to eliminate people until there are only three left, we are going to have a final poll this week. The poll will be based off of all your entries so far, your Task 6 (so your work doesn't go to waste), and your final task. The people participating in this are the people who sent in their Task 6. These people include, kilk34, Deshouliere, ExtravaganceSD, Mangunmeetan, Silver.Wind, Elearwing, and LoveGossip4life. Your final task is to make a magazine cover that involves charity, and fashion. There must be at least one model on the cover and you are allowed to use any charity you'd like, not just the ones we have talked about throughout the competition. I would prefer if you get it to me by Sunday, but I'll accept them on Monday as well. Good luck, and I apologize for all the confusion. Outwit, outplay, and outlast. 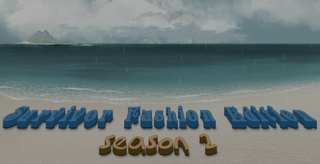 Survivor-Fashion Edition 2.